"I'll take Jake Tapper to block, Peter." For once President Donald Trump was pleased with cable news channel CNN. "I was delighted that CNN is adopting a Hollywood Squares format," said Trump "even though the CNN panels look different those on the original show with the great Peter Marshall." But then Trump picked Paul Begala in the Center Square to win. "When Paul Begala was asked true or false 'The decision on Trump's immigration ban was the worst legal decision in history' and he answered 'False' and host Anderson Cooper agreed, I knew the answers were coming straight from the failing New York Times!" "I should have gotten my circle in the square to win the game. Terrible! Dumb!" “Then I picked Gloria Borger to block," added Trump "and she was asked true or false 'there were millions of fraudulent and illegal votes against Donald Trump in the last election' and she said 'False' and Anderson Cooper agreed. 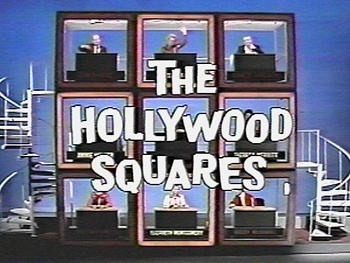 The real Hollywood Squares never lied to the American people like that! "Where are Charley Weaver and Paul Lynde when you need them?" Well, CNN should have hired some clever humorist like you and me to sit in those squares. I'm built like Charley Weaver and you have that like smirk like Paul Lynde. We'd never lie to the American public, but we could make them laugh. No, I would lie if it would get me a date with Phyllis Diller. Or maybe Gloria Borger.